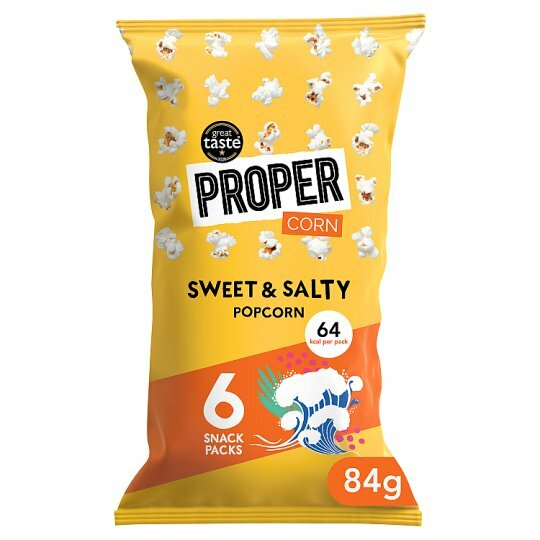 6x individual bags of hand-popped butterfly corn with a perfect balance of sea salt and sweet raw cane sugar. Proper. Small word, big ambition. My father was a hopeless cook but made the best popcorn. We'd spend hours obsessing over new flavours, delicious ingredients and the magic of popping corn. 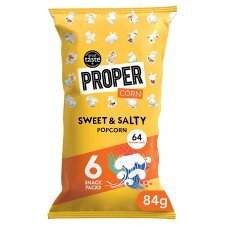 Years later, inspired by the popcorn maker my dad gave me, Proper was born. We started from humble beginnings, improvising by tossing kernels in a refashioned cement mixer! Now, we're a proudly independent company making what we think is the best popcorn in the world. For us, taste is everything. Take this pack of Sweet & Salty. 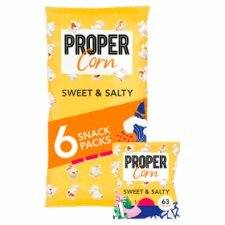 We use a perfect balance of sea salt and raw cane sugar to give our hand-popped, butterfly corn its distinctive, caramelised glaze.